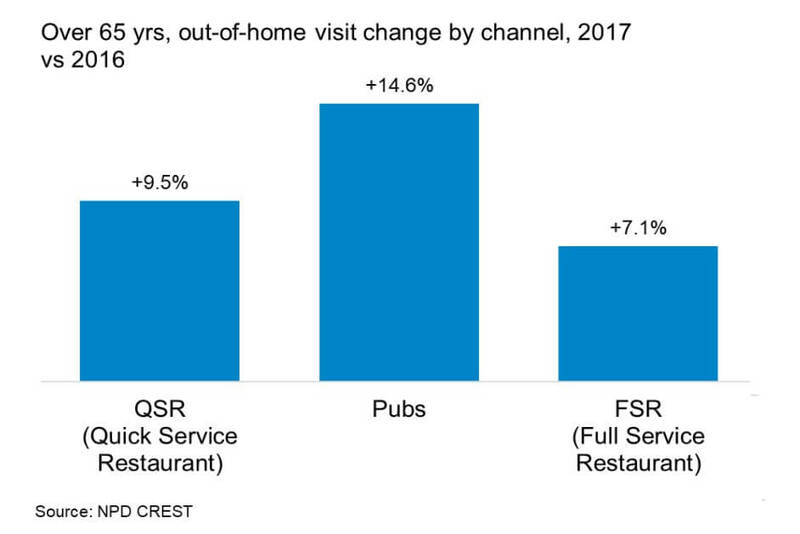 Most notably, 9.5% more visits were made by over-65s through the biggest and most important channel, QSRs - a choice which might not be traditionally associated with this demographic. Visits to pubs by every other age group declined, but 14.6% more visits were made by diners aged over 65. The trend is similar for FSRs: growth is coming only from those in the 50 years and over age groups. 1.The number of older people in the UK is increasing. ONS data shows that between 2011 and 2016, the number of over-55s grew by 8.2%. The 2016-2021 increase is forecast to be 9.9%. 2.The youngest baby boomers are joining older age groups and carrying their out-of-home food consumption habits with them. Eating out for this cohort is typical, not just an infrequent, special occasion treat. 3.Over-55s generally have higher disposable incomes. Mortgages have been repaid, final salary pensions are more common and children have left home. For some older people, eating out and to a lesser extent eating meat, were rare treats and not commonplace. This attitude is shifting, so if positioned correctly, there are opportunities for the meat industry and it’s possible that red meat and food service can grow together. YouGov research shows British cuisine is the nation’s favourite, particularly among those aged over 55 - 83% of this group said they preferred to buy British food where possible. Maybe older consumers can be tempted into eating out even more often if the produce is British and the menu has a focus on ‘Britishness’. Something to watch is the 74% of 55+ year-olds who say increasing food prices are their biggest concern when it comes to their financial circumstances (IGD Jan. 2018), Therefore, any pressure on household budgets due to grocery inflation is likely to impact their propensity to eat out, something that will also impact other age groups.